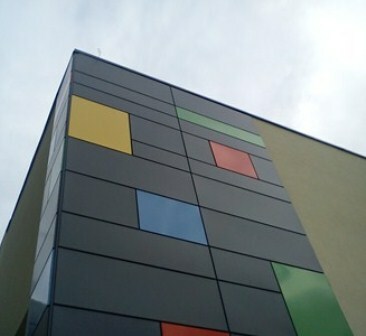 Facade systems ZC1025 PM and ZC1025 KM consists of external cladding panels made of sheet metal and a supporting sub-system, which is made of metal sheeting. Facade systems ZC1025 and ZC1025 KM include modules / cassettes and subsystem that provide a precise panel and strengthening and the quality to align the unadjusted base load-bearing walls (subsystem provides compensation to the assembly process). 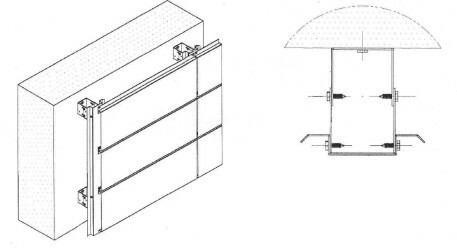 Both systems similarly provides cladding of specific building elements (column collars, parapet by covering, cap, etc.) 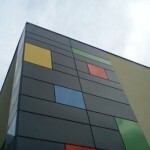 to lay out in the same style with the rest of the façade cladding. Raw metal sheet materials set by the industry standard. Finish: pre - coated sheets or powder coated panels with the appropriate exterior color. Raw metal sheet materials set by the industry standard chosen by the architect. Decorative module / cassette final design Panel as a profile, with open ends. Panel as a cassette, bent ends.